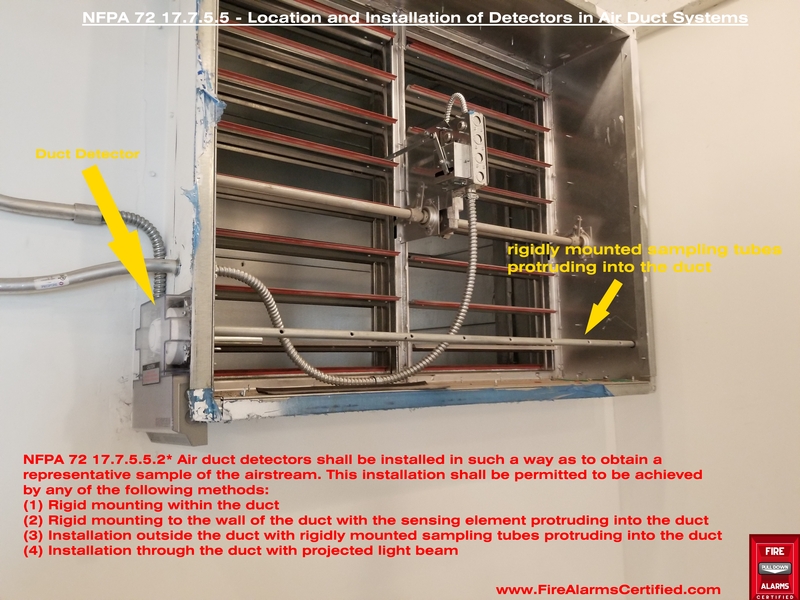 What are the requirements when installing smoke detectors in air duct systems (as per NFPA 72)? Pictured below is a smoke detector installed as per (3) above; where there detector is installed outside the duct and a rigidly mounted sampling tube protrudes into the duct. True or False. NFPA 72 allows a smoke detector not listed for air duct system, as long as the detector is installated outside the duct system and complies with the manufacturers specifications. Answer to this question is obviously Flase; as NFPA 72 only allows smoke detectors to be installed for duct detection to be listed for such. NICET Certification – Fire Alarm System Pop Quiz Question: Remote annunciators shall be ____________?